Asia Pacific Smart Water Metering Market size was valued over USD 85 million in 2017 and the annual installation is set to exceed 6 million units by 2024. Asia Pacific smart water metering market size will grow on account of increasing non-revenue water (NRW) loss owing to aging distribution channel. Major rural areas across the region are facing acute water scarcity while inefficient consumption from the urban development leads to considerable wastage. Need for effective management along with the advent of digital technologies enabling effective remote monitoring and control systems will stimulate the product demand. Rapid expansion of commercial establishments on account of increasing development of Special Economic Zones (SEZ’s) will boost the Asia Pacific smart water metering market. Ongoing regulations by respective government authorities toward the replacement of existing meters coupled with active measures under the smart city programs will enhance the industry outlook. In 2015, the government of India under its Smart Cities Mission has planned to establish 100 smart cities for which about USD 13 billion have been approved by the cabinet. Real time data monitoring, effective leak detection system along with two-way communication between consumers and utilities are the key parameters which will stimulate the AMI smart water metering market. The technology allows the users to measure hourly consumption resulting in billing accuracy and water conservation. In addition, integrated SCADA and GIS technologies further improves the system performance by providing more control and communication options. AMR meters are predicted to grow over 14% by 2024. 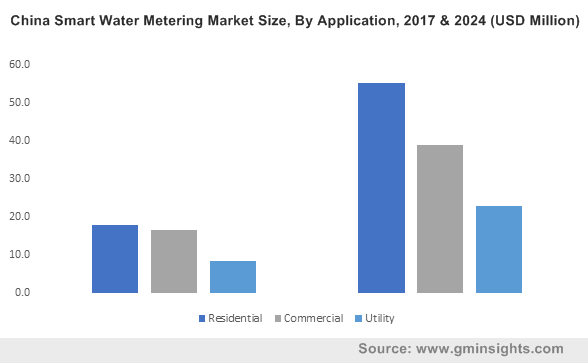 Ongoing government measures toward promoting the deployment of water meters coupled with rapid expansion of residential and commercial establishments primarily across emerging economies will drive the smart water metering market growth. Residential smart water metering market was valued at USD 34 million in 2017. Consumer inclination toward water conservation and billing accuracy along with government mandates toward replacement of existing meters will propel the product demand. Advanced meters help the end-users to reduce water bills by facilitating software applications to restore the last captured data in case of failures. Effective billing management along with real time consumption information will propel the smart water metering market across the utilities. Significant reduction in NRW losses coupled with water savings on account of efficient leak detection systems will positively impact the product adoption. Rising demand for hot water primarily across hotels and malls along with the growing need to monitor consumption will drive the smart water metering market share. These meters can be deployed across residential applications for temperature above 1300 C and effectively measuring the individual hot water consumption of a multistory building. Cold smart water metering market will grow on account of increasing demand from commercial and industrial applications. In addition, ongoing government mandates toward deployment of individual water meters across residential establishment will further enhance the industry outlook. India smart water metering market size is projected to grow on account of aging infrastructure, leakage issues and non-revenue water loss. The government is adopting active measures for promoting water metering across the country under its smart cities program. Growing population along with rising demand from agricultural sector will further augment the business landscape. China smart water metering market is set to expand over 15% by 2024. Severe water scarcity and degraded quality are the major concerns across the nation. Active promotional programs coupled with the adoption of digital devices by government authorities will positively influence the industry outlook. As per the 12th & 13th five-year plan, the government has introduced smart city investment hub for the deployment of smart electricity and water meters across the nation. 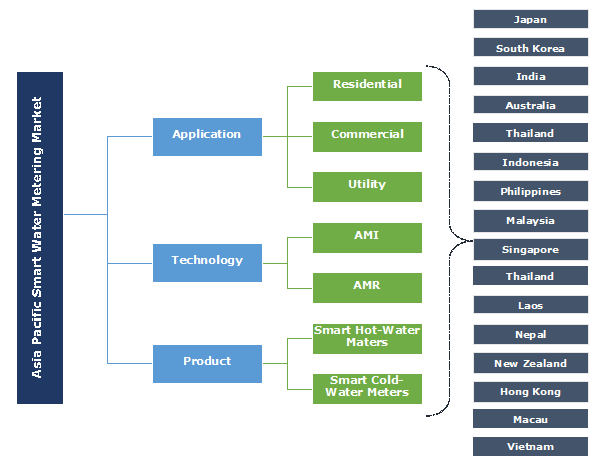 Key participants across the Asia Pacific smart water metering market include Diehl Metering, Peltek, Apator, Schneider Electric, Siemens, Honeywell Elster, Badger Meter, Itron, Aclara Technologies, Landis+Gyr, Arad Group, Sensus, Kamstrup, and Jiangxi Sanchuan. Acquisition and collaboration with leading technology providers are the key strategies adopted by industry players to provide cost effective smart metering technologies. Government incentives and funds have further supported the industry players to strengthen their position across the region. Smart water metering is an effective water management technology used to measure real time consumption and identifying damage in the distribution channel. The system can be deployed across residential and commercial establishments for individual metering. The product can minimize the work of utilities by utilizing advanced technologies for remote reading, pressure control and leakage detection.